For this mid month working bee we plan to continue our woody weed removal along the Federal Golf Course access road, working towards where the November 5 working bee finished. 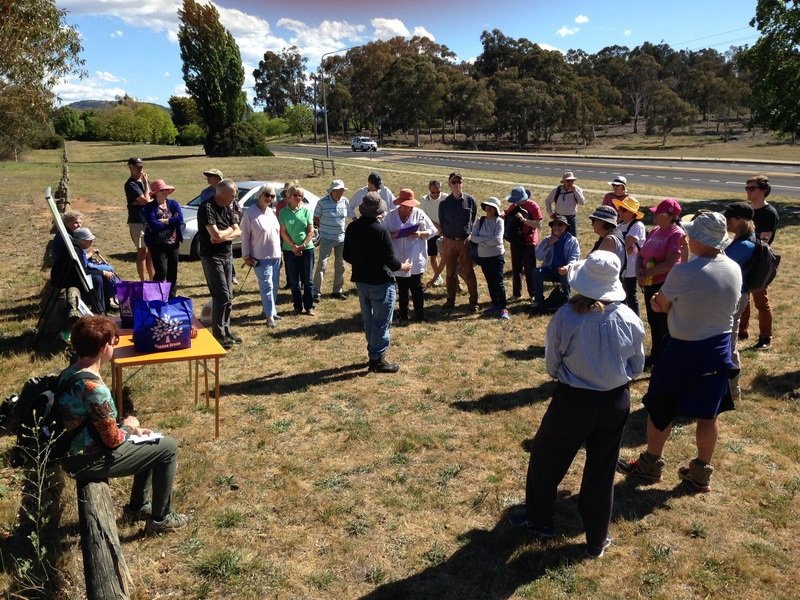 The very popular butterfly walk is being conducted again this year on Red Hill. We are fortunate to have butterfly expert Suzi Bond to lead this walk. Suzi is the coauthor, with Steve Holliday and John Stein, of the popular ‘Field Guide to the Butterflies of the Australian Capital Territory’. I am sure that she will have a few copies available to purchase on the day. Everyone is welcome to attend. The event will be cancelled if it is raining. Over 40 members of the community and Greens MLA Ms Le Couteur, were taken on a conducted walk by environmentalist Dr Michael Mulvaney, to demonstrate the environmental values of woodland along the edge of the Red Hill Reserve, which is under threat from residential development on Kent Street (S66) Deakin. Walkers heard about the high value woodland, rare and endangered species which could be impacted, in addition to the potential hazards to future residents posed by a historic toxic waste tip site located adjacent to the boundary of the proposed development. Representations have been made to the ACT Legislative Assembly by community groups and a petition is being circulated urging the ACT Government to plan the open space around Red Hill strategically so that ad hoc developer driven developments are properly considered. This month we plan to move to the west side of the Reserve and work on the woody weeds which are appearing along the Federal Golf Course access road. A group of Red Hill residents are concerned a proposal for a major residential development in the area may be too close to an old contaminated dump site for housing. Developer Hindmarsh is proposing to redevelop land bordering the Red Hill Nature Reserve on Kent Street, with at least 200 new units. The territory government has lost a vote over calls for an overarching “environmental plan” for the Red Hill nature reserve and surrounds, after an at times fiery debate on development in the area on Wednesday. Members of the Red Hill Regenerators and the Canberra community are invited to join environmentalist and Red Hill expert Dr Michael Mulvaney, to learn about the ecology and wildlife of Australia’s critically endangered Red Gum/Yellow Box grassy woodland, of which Red Hill is an prime example. The 1 km walk will start from the top of the walkway between 57 and 59 Glasgow Street Hughes, and follow a well marked trail to end at the site of the proposed housing development on Kent Street, near the Deakin telephone exchange. More information is provided in the attached flier. A number of community groups in Deakin, Hughes and Garran have expressed concern that the ACT Government may proceed with piecemeal development on green spaces adjacent to the Red Hill Nature Reserve. A petition will be presented to the Assembly on 22 November 2017. The petition can be downloaded here. Concerned members of the community are invited to circulate this petition and return it to the address shown, before the closing date. Brett McNamara, ACT Parks & Conservation Service has written about the history of the historic callistemon plantings on Red Hill. Read the article here. The Assembly Minutes of Proceedings of 25 October 2017 can be found here.